I would like to thank the publishers, Harper Collins, for an arc copy of this book in return for a honest review. Olly Guinness hasn't had it easy lately, his thirteen year old daughter nearly dies from alcohol poising just weeks before he tragically loses his beloved father, Pops, to Cancer. Olly realises that he has lost control of his life, he had no job, due to being made redundant a year previously and he and his wife, Mae, are growing further and further apart with every passing day. But Pops wasn't going to leave his family without giving them one last surprise. When the Guinness family return home from Pops' funeral, there is a camper van waiting for them in the driveway. They soon learn that Pops is sending them on an eight week trip around Europe, in Nomad, their new campervan. After a few false starts, we follow Olly, Mae and their to children, Evie and Jamie as they take the trip of a lifetime around Europe. 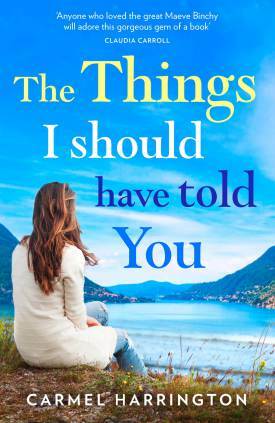 What follows is a heartwarming and heartbreaking story of how one family learned how to enjoy every moment and to 'leave nothing unsaid'. This was the book that I was most anticipating this year, and I am more than a little bit delighted to say that it exceeded my expectations in every way possible. I am a huge fan of Carmel's books and I feel that The Things I Should Have Told You is her best so far. This is beautifully written book, that I loved from start to finish. I loved the idea of this book, and ordinary family, not without their fair share of problems, setting off on the adventure of a lifetime, guided by Pops, who is sadly no longer with them. I adored that the first chapter of the book is told from Pops point of view. This gives us a little insight into Pops life and I think that it really helped to set the story. From chapter two onwards, each chapter is told from the point of view of one of the four members of the Guinness family. I love that the story is written like this, because it allowed me to get to know each character better and it allows us to follow the family's adventure from the point of view of both the adults and the children. The biggest appeal in this book is without a doubt the characters. Olly, Mae, Evie, Jamie and Pops are some of the most relatable characters that I have ever had the pleasure of reading. There are so many people in Ireland, and indeed all over the world, who can relate to what the family are going through. There are not many people left in the world today, who hasn't been affected by Cancer in one way or another. For many, who have lost a loved one to this horrible disease, they will be able to relate to what Olly and the rest of his family are going through. Likewise, there are many people who can relate to Olly being made redundant and Mae having to work twice as hard just to make ends meet, while Olly becomes a stay at home dad and pushes his family away, due to shame and frustration. It is Evie who I can relate to the most. Having been bullied myself when I was younger, I found that I was really able to relate to Evie and what she is going through at the beginning of the book. Carmel was able to get the feelings of the characters in relation to these issues across, while still dealing with that in a sensitive light, and for that she must be applauded. The Things I Should Have Told You made me cry tears of sadness and of joy, sometimes simultaneously. It is heartbreaking and heartwarming in equal measures. It was such a pleasure to join the Guinness family on their trip through France, Germany, Austria, Romania, Serbia, Croatia and Italy. I cherished how the letters from Pops lead the family through their journey and his gorgeous letters left me with a huge lump in my throat on more than one occasion. One of the best things about being a reader is that you get to travel to many different places with many different people, without ever leaving your home and I can honestly say that the time I have spent with the Guinness family is one of the best adventures that I have ever been on. The Things I Should Have Told You was everything I wanted it to be and more. It's funny, smart and insightful. Beautifully written and it is evident that Carmel has put her heart and soul into writing this gem of a book. I could have easily have devoured this book in one sitting, but I am so glad that I chose to savour this book over the course of a few days. Everytime I closed the book, I imagined that the Guinnesses were happily involved in whatever activity I left them at, and that made me smile. This book has the most beautiful ending that I never would have seen coming. The Things I Should Have Told You left me with a huge smile on my face and when I closed the cover or the final time, a little bit of my heart remained between the pages.